Worlds Deadliest - Is Batman a Ninja? I think it’s safe to say that anyone in touch with modern pop culture is familiar with Batman. No introduction needed, really. There has been enough saturation of the character since 1939 in various media that the core concept can withstand the changing of any decade. The basic legend for every character iteration is pretty much the same, be it the New 52, the Christopher Nolan films, and so on and so on and so on. Batman was born when his parents were gunned down in a slum area of Gotham City. Billionaire Bruce Wayne used his wealth and resources to train his mind and body to become the ultimate crime fighter who comes out only after the sun goes down to put a pounding (but never a lethal one) on the Joker, Two-Face, the Penguin, and the rest of the many colorful and unique personalities who comprise his rogues’ gallery. The dark uniform, the gadgets and weapons, the fighting style; it all sounds much like a ninja, right? Well, there are similarities, certainly. But is Batman really a ninja, like the ones he trained with in the film Batman Begins? Not really, no. To understand why, the origin of Ninjitsu must be taken into account as well as what a Ninja actually is. It is believed that in the 15th century in Japan, during the Sengoku (Warring States) period, the Ninja came into existence in the remote Iga Mountains, an area almost completely cut off from the rest of Japan. While Samurai battled openly, the Ninja did their work behind a veil of secrecy[i]. The role of the Ninja was one of being a spy, acts of sabotage, and of course and perhaps most notoriously, assassination. Their mission was always to go unnoticed and fighting was a last resort, combat being the least important skill set in their arsenal. Having stealth, evasiveness, and the ability to isolate and eradicate the intended target was the true core of Ninjitsu. As assassins for hire, a Ninja would often be the target of attacks from Samurai or rival clans. To survive, the Ninja had to learn to kill without being noticed and had to defend themselves from surprise attacks. In feudal Japan, it was illegal for anyone other than Samurai to own weapons[ii]. For the Ninja, his sword was to him as the gun would be to the outlaw in the Wild West. While it wasn’t always possible to have a sword on a mission, Ninja developed other instruments to deal out distraction and death. They employed a variety of weapons, one of the most notorious being the shuriken. Shuriken were fashioned from common materials such as coins, nails, and farming tools[iii]. Different clans would have different types, from the infamous throwing star shape to something that looked more like a small spike. While a shuriken would have a very minimal effect against the armor of a Samurai, they would often be used to injure or distract as the Ninja made his escape. The traditional garb of a Ninja is not believed to have been the black body suit that has been made a trademark in films, comic books, and etcetera[iv]. They would often infiltrate enemy territory dressed as peasants or farmers, missions could be mere hours or take many weeks, depending upon the complexity of the task. The Ninja faded into relative obscurity in the 17th century during the Tokugawa period, which brought about two centuries of relative peace to the island of Japan[v]. And it was as modernization began to creep in that the techniques of Ninjitsu were adopted into various Japanese martial arts such as Judo, Karate, Jujitsu, and Aikido. It wasn’t until the Meiji Restoration of the 19th century when the Ninja became a popular character in the writing of the time[vi]. It was then that the Ninja began that inevitable rise to fame. An argument can be made that Batman may have had Ninjitsu or at least a Ninjitsu styled training course. The comparisons that can be made between his vast array of weaponry, fighting abilities and so forth is all there. As it is, Bruce Wayne would have probably received his training at a dojo located somewhere along the outskirts of Tokyo called the Bujinkan Budo Taijutsu. It is the only place in our modern world that teaches complete Ninjitsu techniques from combat to the more silent and sinister tactics. Tens of thousands of people are trained there every year, with most of the students hailing from the United States. Courses tend to have a different theme every year, resulting in different forms of practiced Ninjitsu fighting styles. Who knows how many of the denizens of the DC Universe characters could have possibly been through there since the school‘s inception; the list could probably go on for pages. 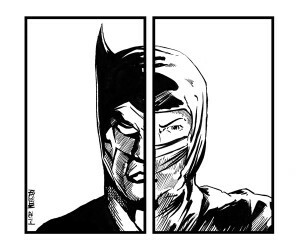 But the thing that really proves that Batman is not a ninja is that the basic concept of Ninjitsu goes against every belief that the character has. 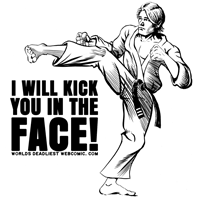 Ninjas are the street fighters of feudal Japan, it is a martial art designed strictly for killing. The entire point of a Ninja’s training is that the lethal techniques are designed entirely for a person to come in to a place, execute a procedure, and get out in a way that is quick, quiet and effective. And if there is one aspect of Batman that carries over through all the various interpretations, it is that Batman does not kill. It is the only rule he has in his war on crime and he does not break it. He is a moral man, and is probably the best modern interpretation of the past 75 years for a stalwart champion of the fifth commandment. To begin to say that Batman has more in common with a Samurai makes for a richer and much more interesting rhetoric. His own code is nowhere near as complicated as the Bushido, but it exists. Consider the whereabouts of the modern day Samurai. He has moved from being the soldier on the field fighting for his lord to the corporate boardroom where the disciplines of the Samurai are now practiced. And if that doesn’t sound like a role that is carried out by both Bruce Wayne and his alter ego Batman, then I couldn’t possibly tell you what does. About the Author; Geoff Mosse is a working writer and artist that lives a quiet, humble existence in a heavily armed and fortified compound. His first original graphic novel, The Mick, will be released in 2014 from Red Handed Studios.